Ribnjak is the oldest and best-known park in Zagreb. My favorite spot in the park is located in the middle. It’s a Roman tombstone made in the 2nd century AD, where a Roman father mourns for his 30-year-old son Egnatuleius Florentinus. Watching this tombstone reminds me how no matter the time, some things never change, like the love we have for our children and parents. In the Middle Ages, there were fishponds owned by the priests living in Kaptol here and it was part of the Kaptol city fortification until the 19th century, when Zagreb’s Bishop decided to design a park that would later become one of the symbols of my city. Ribnjak was a private property of the Zagreb archdiocese until the end of WWII when it finally opened to the public. 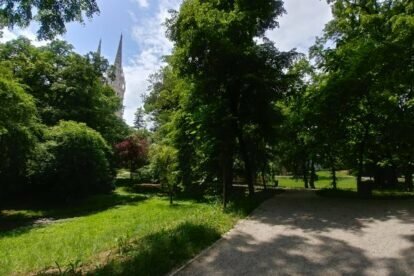 Today, it is a green heart in the middle of the concrete jungle, firmly guarded by the high towers of Zagreb Cathedral. Walking through the park brings different colors and smells, depending on the season. Each one is beautiful and I don’t not miss any of them. As an amateur photographer, I love the big and small sceneries found here. From vivacious squirrels to small puddles of water reflecting the trees and sky, everything looks perfect through the lens of the camera. In the summer, my dog and I come here to chill on the grass in great shades of old oak trees and take our break from the city in the middle of it.